Sledgehammers sent asphalt flying last fall as students at Holy Spirit Catholic Elementary School battled to reclaim their playground as a space for nature to thrive. Now, nearly eight months later as spring finally warms up, the students were out in force on Thursday morning to take things to the next level – with a helping hand from Windfall Ecology Centre and the Healthy Kids Community Challenge. Over the past few months, the Holy Spirit community has reclaimed over 115 square metres of playground as garden space. Now, the students have moved operations to the front of the building, transforming the otherwise plain Stone Road entrance to the school into something of a Victory Garden. “We’re planting all different types of plants,” explained Grade 5 student Martino Milani, as he and his fellow students listed off sneezeweed, swamp milkweed, wild strawberries, Canadian rye, and hairy beardtongue as among the plants and flowers they had already put in place – all species native to Canada. “The kids are getting out there and planting lots of native species,” said Gemma Goldstein of the Healthy Kids Community Challenge. “We de-paved 115 square metres to allow water to infiltrate and have less run-off into Lake Simcoe, now the kids are really getting involved: they are learning how to dig a hole and how to plant with all the safety precautions around it. They are also learning about all the different plants with information sheets so they can read up an all the native plants. And, by late Thursday morning, the students were more than eager to do just that. 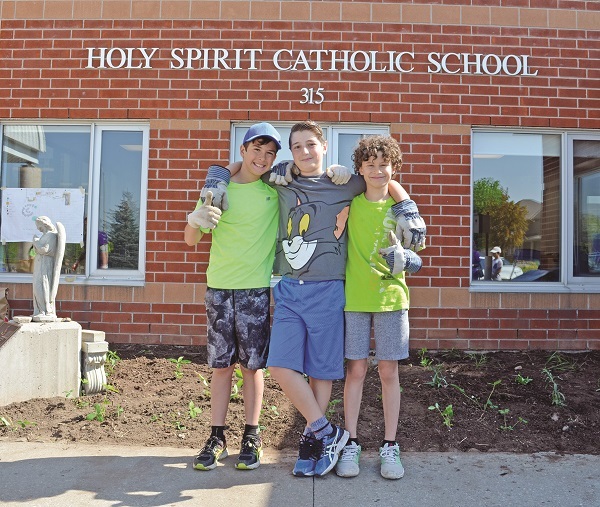 The Holy Spirit de-paving project is one of a number Windfall is spearheading in York Region, and the second in Aurora behind Light of Christ Catholic Elementary School in Aurora’s southwest. Windfall continues to make grant applications to expand the program both within Aurora and York as a whole. “It has been a really positive experience,” says Ms. Goldstein. “Students love that they now have a beautiful place to play instead of a concrete jungle, basically. They even have some interaction with nature when they get out. They love getting out and gardening instead of being inside an indoor classroom, they get to enjoy the weather, come out and plant and learn a bit about the environment and what they are doing – and know that what they are doing is not only fun, but they are actually having an impact, too.